Life is richest in the everyday moments - 365 days a year. Aggie traditions run deep, and the Aggie spirit runs deep in my family. My dad, sister and brother are all Aggies, and I could sing the Aggie War Hymn at the age of three. I was a proud member of a different Corps of Cadets, but my love for all things A&M isn't diminished by the fact that I'm not a graduate. This past weekend, the Aggies played the University of Arkansas here in Fayetteville. The game has been circled on my calendar since the football schedule was announced, and I had hoped that my parents might make the trip up for the game, too. 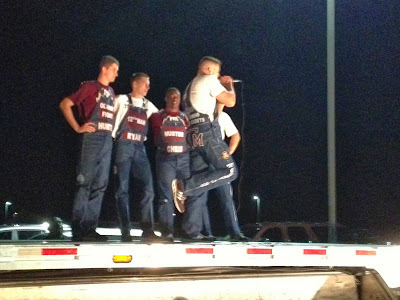 Then, this past spring, my brother was elected an Aggie Yell Leader. Not cheerleader, you see - Yell Leader. I mentioned Aggie traditions run deep - and Aggie traditions are unique. As a University with a military, all-male heritage, they don't have things like cheers or fight songs. No, those are for regular, run of the mill institutions. At Texas A&M, they have yells. And a war hymn. Because, by God, A&M is Old Army. Once he was elected as one of only five Yell Leaders, the game took on even more significance for me. The guys on the field in white are one of the enduring memories I have of watching A&M football all the way back to my first glimpse of the Aggie team on TV. For my brother to be one of those... well, it's basically having a celebrity in the family. With my brother coming up as part of the pageantry of the game, my parents, sister-in-law and niece made the 9 hour drive to be there, too. And what a weekend we had. Friday night, Roy and his fellow Yell Leaders came over for dinner. Caroline was a little bit star struck - she had a plan to get a picture of her with all of the Yells, get their autographs, and take it in to school to show everyone. Probably less impressive in a classroom full of kids raised on calling the Hogs, but I love her moxie to bring it in, anyway. So the guys came over with their advisor for a big ol' cookout, courtesy of my husband who happens to be one of the great house-party-throwers of all time. Burgers; hot dogs; brats; ribs; potato salad; pasta salad; watermelon; chips; dessert... throw in conversation with some of the nicest young men I've met since I was a college kid myself, and it was a great night. We talked football, watched a little bit of football, and of course, took pictures. They headed out for another get together, and we got the kids down - for a nap. Because Friday night before a football game means Midnight Yell. And if you haven't been to Midnight Yell Practice... well, then you're missing out on one of the great Aggie football traditions. Even with away games, Aggies get together at midnight before a football game and literally practice the yells. There is also some story telling; some poking fun at the other team; and in this case, some heckling from Razorbacks who showed up. By the end, even John had figured out how to hump it - and his favorite yell, of course, was: "BEAT THE HELL OUTTA ARKANSAS!" I'm conflicted about how proud I am. We get to Saturday night, and it's time for the game - after a torrential, driving rain in the afternoon - but thankfully, most of it had moved out during the day. Mom and Caroline decided to stay home, but me, my dad, my sister-in-law, my niece, Justin and John all headed over to campus. Roy had hooked us up with player tickets, and we were six rows off the field. Reynolds Stadium was rocking, and the Yell Leaders had the Aggie section fired up. John's first football game, and I love that it was to see the Ags. Score was a little closer than I would've liked, but a win's a win - and seeing Johnny Football is one of things I'll be able to talk about when I'm old (okay, oldER - I get it). Being at Midnight Yell and then the game reminded me of the love Aggies have for their school. Here we were, probably 600 miles away from College Station, at midnight in the parking lot of a high school in Springdale, Arkansas, and there were hundreds of Aggies of all ages there to practice yelling for their team. Not a football player in sight - this was about the spirit of Aggies, the love of tradition, the love of their school, and their love of other Aggies. Then in Razorback Stadium, with on and off rain (mostly on through the entire third quarter), outnumbered and outyelled by Hog fans, no Fightin' Texas Aggie Band, and still the Aggies were heard. The Yell Leaders gave us the signs, we passed them back, and we yelled ourselves hoarse. Because that's what the 12th Man does. No band, no problem - between the 3rd and 4th quarters, we still sang the War Hymn. Because that's what the 12th Man does. That is the Spirit of Aggieland. So many great things about the weekend - seeing family, seeing my brother on the field, being in the middle of the 12th Man while the Aggies beat the hell outta Arkansas. My son is now determined to follow in his uncle's footsteps, which of course thrills me as I'm constantly trying to make sure my kids know they're at least honorary Texans. 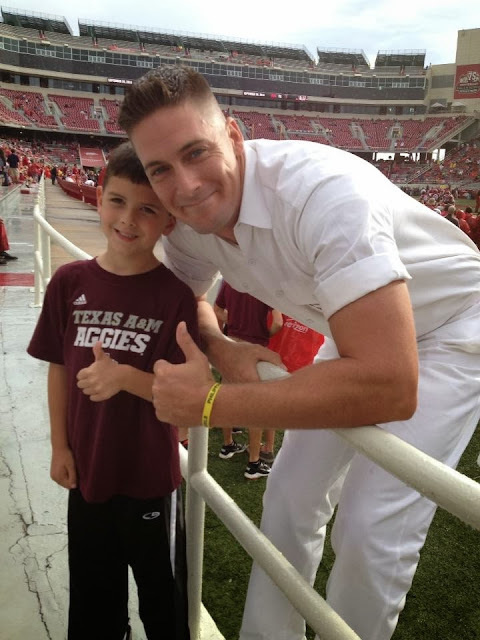 Maybe someday they'll be more than honorary - maybe someday they'll be Texas Aggies. Amanda- this is amazing. Even I feel Aggie pride - and I'm the farthest thing from a texan!!! Roy looks SOOO much like you!!! You guys both have the May eyes! And I must say, y'all down there get a lot more excited about football than us yanks!!! Get Coussoule365 in your Inbox! Leslie Stein: Author. Speaker. Life Enthusiast.